Tomb Raider is a capable and exciting rebirth for a series that was, until now, struggling toward relevance for years. Stowed away on a large ship with the crew and a group of fellow students, Lara Croft approaches the ancient, storm-laden isle of Yamatai in search of the remnants of an ancient civilization centred around a vengeful sun goddess. Plans to shoot a TV documentary series on their discoveries soon goes awry, though, and the island's violent weather claims their ship, scatters the crew, and leaves one of gaming's most iconic characters in the hands of psychotic cultists inhabiting the place. From there, the stakes are constantly stacking as Lara tries to escape her captors, find her friends, and mount an escape any way possible. From the very first moments, things don't come easy for our reborn heroine. In fact, the first few hours of the game dabble in these moments of immense pain and destruction a little too often, putting a borderline fetishistic focus on Lara's protracted, tortuous welcome to the world of unearthing ancient, supernatural civilizations. The atmosphere and presentation are spot-on from the very beginning, but the storytelling struggles during this opening act. A huge part of the game's pre-release marketing focused on Lara's turn from a keen archaeological scholar to a hardened survivalist, though it ends up being the least interesting part of the whole journey. There are a few brief scenes in the opening chapters that hint at some sort of discomfort with surviving the elements and taking life, but once those moments are passed, it's pretty much open season on just about anything that moves on your screen. The idea of depicting that sort of intense change in a person is a great one, but it's just far too abrupt and unconvincing here. As you progress further, Lara obtains even more brutal abilities with which to dispatch enemies - throwing dirt into the eyes of a foe shortly before braining them with your climbing pick is a particularly grisly example. 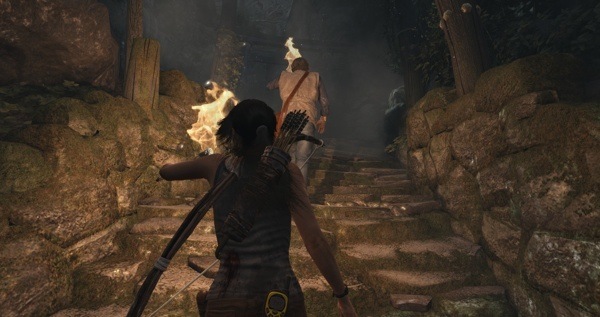 It's a grotesque maneuver, but one not possible until a fair way through the adventure, by which point the stakes are so high that Lara is clearly past the point of any human sympathy concerning the dangerous cultists. By the end of the game, she's grunting and yelling at enemies as you mow down groups of them from cover with your trusty bow, pistol, machine gun or shotgun. Intentional or not, Lara's descent into grotesque violence is both a little silly and worrying at the same time, but the game makes good on tying many of these moments into story and character developments. Without giving too much away, I'll just say that the game does an excellent job of investing you in its story and characters. Before and just after Lara's transformation into a killing machine, though, it's a little hard to reconcile the competing pictures into something believable. Meanwhile, several different game systems attempt to intertwine throughout the journey across the island, and for the most part, they interlock pretty darn well. Of course, raiding these tombs and pilfering their trinkets requires a ton of good old-fashioned climbing and jumping, along with the aforementioned shooting. Lara can jump high, bump off of walls for a little extra height, swing on poles, shimmy across precarious ledges, and leap between huge gaps with superhuman grip. Y'know, Tomb Raider stuff. It all fits together well, and the game creates different kinds of tension very well. Although the combat is heavier than ever for the series, there are plenty of pensive walks and climbs through some gorgeous scenery, too. The game is made up of a bunch of areas that progress sequentially but offer lots of extra space to explore and mess around in, and there's plenty of collectible item sets and optional tomb challenges to dig up beside what lies at the next objective marker. A ton of collectible relics, journals and other ancient bric-a-brac also help give both the island and its inhabitants a history. You could easily get through the story without finding any of this stuff, but being privy to the smaller details makes the bigger story beats all the more impactful. Dense, story-driven collecting can often grate on me, but Tomb Raider's audio log entries are concise, evocatively written and well-acted. Thankfully, the game allows you to return to the island after the story's conclusion to mop up any extras you missed. You'll probably end up going for a bunch of extra stuff the first time through, though, both because it's relatively easy to locate and because just about everything you do gives you experience points and "salvage" needed to upgrade your weapons. Although something about that kind of numerical progress is enticing, little of it feels essential. Tomb Raider starts out pretty easy, and once you've put some points into powerful counter attacks and ammunition upgrades, it becomes even breezier. The hunting is likewise enjoyable but underused. In a game so tonally grim and thematically concerned with the struggle of survival, it was a little disappointing that it merely ticks up your progress bars instead of more meaningfully and logically applying to your survival. Hunting for animals is an enjoyable activity, but instead of giving you food to eat or pelts to wear in the cold, you'll rack up some more salvage that you could potentially use for, say, adding a grip to your shotgun. That's weird! More disappointing is the reliance on a particularly tired big-budget fallback - the exploding set piece. On more than a few occasions, you're unable to do much more than run along a path and jump over a couple holes in the ground while everything around you explodes spectacularly. These sorts of canned, eye-candy moments crested years ago in Naughty Dog's Uncharted 2: Among Thieves, and nothing about the way they're done here invigorates the concept in any way. If anything, they undermine the fleshed-out, subtle storytelling moments they interrupt. These sorts of discrepancies crack the game's otherwise convincing presentation of a gritty, brutal survival scenario and feel like they were added out of obligation to mainstream expectation instead of what may be best for the game. I couldn't help but feel that with more adherence to the story's thematic pillars and some more synchronous survivalist action to go along with it, Tomb Raider could have been a truer version of its already great self. 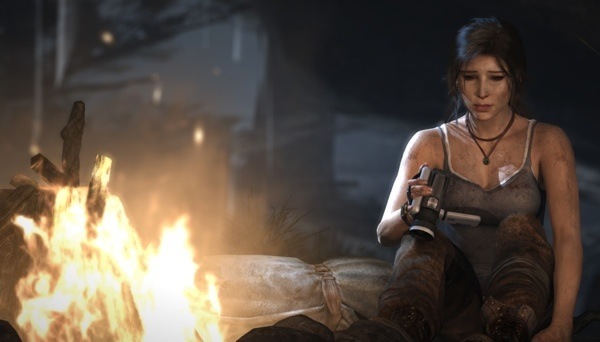 Some of these more negative aspects are offset by the game's visuals, which do an incredible job of building up and maintaining the exciting, dreadful mood of Lara's journey. It's got some great lip-syncing and character movement during cutscenes, too. On the PC, that sharpness and level of detail only scales up further and further, depending on the power of your machine. With near every option set to "high" presets, it was tough for me to pick apart what was unfolding on my TV. The game looks stunning. There's even a special "TressFX" feature that lets you enable more advanced modelling for hair, giving Lara individual threads that flow around freely as she moves. It's a neat idea that's definitely worth a look, if only to test the mettle of your machine's video card, but ultimately it just looks a little…off. Not really like how hair works. Perhaps technology is just not ready for advanced, real-time mane rendering just yet, but Tomb Raider nevertheless looks awesome. A special nod also due to the game's excellent, unnerving score and competent voice acting, both of which lend further flavour to the game's morbidly fascinating world. While not every promising idea Tomb Raider has is pulled off successfully, it nevertheless turns in a tense and memorable ride that combines modern game design with its forebears' adventurous spirit in some exciting ways. Some of its missteps may well come at the cost of your enjoyment, but most can't hope to hurt the adventure in the long run. Although it never fully finds its identity, this is a game and a story worth seeing through. Crystal Dynamics took what worked in Tomb Raider and made it even better. Rise of the Tomb Raider is one of the best games of the year. If you're interested in a return tour or want to see it all for the first time, though, consider the Definitive Edition a great way to play a great game.